Google Bites Back! How SEO Has Changed Over the Last Few Months! 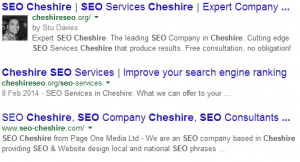 The example is this very website CheshireSEO.org, and how it used to look in Google when you typed in ‘SEO Cheshire’. The photo displayed next to the result, and it says ‘by Stu Davies‘. This is Authorship. It was a great thing, as your eyes are automatically drawn to a face – it psychologically programmed into our brains! This really helped a it pulled more people into your website, rather than your competition. So to combine this with high rankings was a dream! The way to set it up was a bit tricky, and could be hit and miss depending on the sector your website was in, but once done it worked well. And that’s what the problem was, it worked too well! You have to remember, Google is a business at the end of the day, and their number 1 priority is to make money. What is the main way Google makes money? Organic listings like the above? Nope. Adwords and Paid Listings? Oh yes. Google makes approximately $15 BILLION per QUARTER on Adwords alone. So imagine if they design a new feature which means more people ignore the ads, and go straight to the organic listings. It doesn’t last long. Now Google Authorship has been changed by it just being the ‘by Stu Davies’ tag, and no more images. Unless it’s a Google+ page, naturally 😉 . This is a real shame, but I can understand why they did it. Now, it is still useful to be set-up for Authorship, to help build trust with Google and to ensure that it is easier to push out your latest posts and articles via Google+. Next up – Panda Update! So around early September the latest Panda updates started to rollout. Some believe it was more of a refresh, but it did seem to have quite an impact. For those of ou unsure what this is, Panda is a part of Google’s algorithm which checks your site isn’t over-optimised. It looks at things like keyword density, amount of links on a page, title and Heading tags and so on. This latest update seems to be targeting any website that has too many keywords, especially on an exact match domain (EMD), (e.g. your keyword is ‘plumbers in manchester’ so you buy www.plumbersinmanchester.co.uk). It is now very difficult to ensure you don’t over optimise an EMD as Google is well aware this was often an easy choice for SEO firms out there. Now you have to be careful about too much of your keyword on the site, or it could be penalised by Google. The other big update was Penguin – this Google animal targets your links. The ones coming in particularly. So if you have too many exact match links, you’re in trouble, as Google will be able to spot you are spamming the website – the key now is to make your link profile look very natural, and also ensure it is quality over quantity every time! The days of being able to send 5000 rubbish quality links to your site all with the exact anchor text you want (e.g. ‘plumbers in Manchester’) are long gone. Google now assesses where your links are coming from, does it look natural, and is there good websites ‘voting’ for yours. This latest update has SMASHED low quality links, where the majority of SEO firms went to – e.g. directory websites, profile pages, forum links, blog comments are now all very risky.Don’t get me wrong, some blog and forum ones can still work, but ony if you pick a decent authority site and just do 1 or 2 at most. You should also ensure the page it is on is relevant to your own site, and if you can ensure there is at least a few hundred words of relevant, well thought out content to surround the link. If you are targeting WordPress sites where the comments are open, and you see 100’s of other comments all pointing to different sites, then stop! It will only do you harm! The only way to survive Penguin now, is to ensure you have good, high quality links from relevant websites, and make sure your backlink profile is balanced in the right way. So overall, a lot of action fro the Big G this year, and I would imagine a lot of people are hurting. If you were planning on using low quality, cheap links, forget it. If you already have and are feeling the pain, you are probably better off researching how to recover from a penalty, and how the disavow tool works. SEO isn’t dead like some report, it just needs a stronger focus on quality now. At least some of the more shady firms will go out of business, and just leave the ones with a long-term approach left!